Hamas -- which has controlled the Gaza Strip for more than a decade -- had already been on the US terror blacklist since 1997. Washington: The United States on Wednesday put the head of Hamas, Ismail Haniya, on its terror blacklist and slapped sanctions on him -- a move sure to raise tensions, after Washington recognized Jerusalem as Israel's capital. The 55-year-old Haniya, who was named head of Hamas in May 2017, represents the more pragmatic wing of the movement, which said the US move would not deter the group's "resistance." "Haniya has close links with Hamas' military wing and has been a proponent of armed struggle, including against civilians," the State Department said in a statement. "He has reportedly been involved in terrorist attacks against Israeli citizens. Hamas has been responsible for an estimated 17 American lives killed in terrorist attacks." Haniya is now on the US Treasury sanctions blacklist, which freezes any US-based assets he may have and bans any US person or company from doing business with him. The US government also slapped sanctions on Harakat al-Sabireen -- a small militant group that splintered away from the Islamic Jihad, is close to Iran and operates in Gaza -- and two other groups active in Egypt: Liwa al-Thawra and HASM. "These designations target key terrorist groups and leaders -- including two sponsored and directed by Iran -- who are threatening the stability of the Middle East, undermining the peace process, and attacking our allies Egypt and Israel," Secretary of State Rex Tillerson said in a statement. "Today's actions are an important step in denying them the resources they need to plan and carry out their terrorist activities." In Gaza, Hamas said: "The American decision to include Haniya on the terrorist list is a failed attempt to pressure the resistance. "This decision will not deter us from continuing the resistance option to expel the occupation." Hamas has fought three wars with Israel since 2008. The group receives military support from Iran. Iran "continues to support a rogues' gallery of terrorist organizations, including Hezbollah, Hamas, Palestinian Islamic Jihad and others," Nathan Sales, the US State Department coordinator for counter-terrorism, said in a speech to an Israeli think tank on Wednesday. He added that Tehran gives Palestinian militant groups "potentially up to $100 million annually." Haniya replaced Khaled Meshaal, who now lives in Doha in exile, atop the Hamas movement. 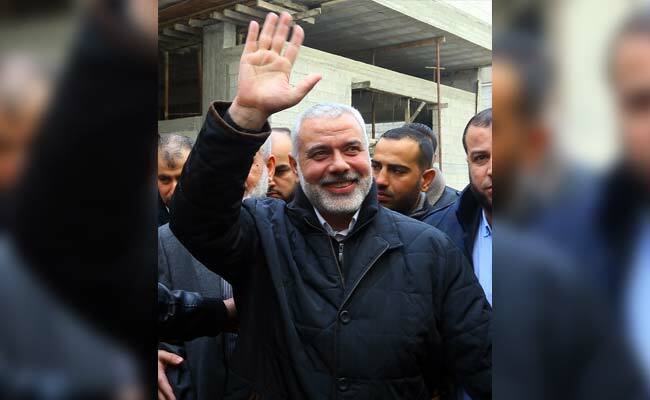 Unlike Meshaal, Haniya will remain in the Gaza Strip. Also known as Abu Abed, Haniya was born in Gaza's Shati refugee camp in January 1963 to parents who fled when Israel was created in 1948. Hamas has frequently highlighted his modest background as a counterpoint to officials within president Mahmud Abbas's Palestinian Authority, who have been accused of being corrupt and too easily compliant with Israel or the United States. Relations between Washington and the Palestinians have been severely strained since US President Donald Trump broke with decades of policy in December to name Jerusalem as Israel's capital. The Hamas leader voiced rage over the decision, saying it "crosses every red line," and called for a new intifada, or uprising. "This Zionist policy supported by the US cannot be confronted unless we ignite a new intifada," Haniya said. Days of sometimes violent demonstrations in the Palestinian territories and other parts of the Middle East ensued. Washington says the new embassy will open in Jerusalem in 2019.